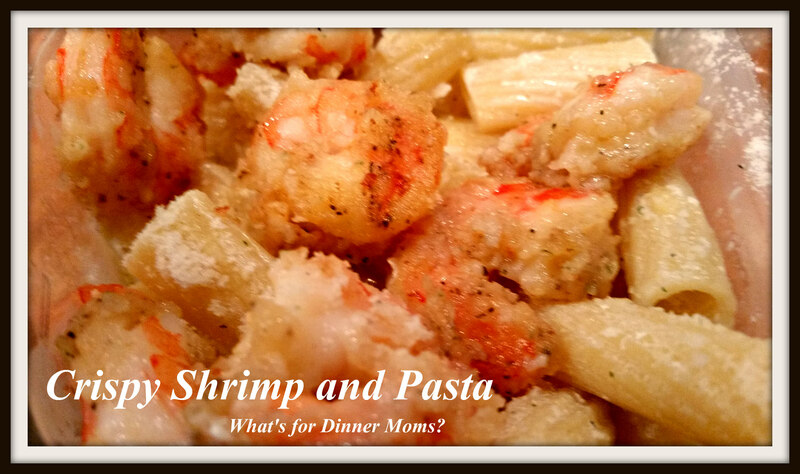 Crispy Shrimp and Pasta – What's for Dinner Moms? When I first started talking about making this dish the kids looked at me skeptically. They love shrimp but they usually have it cooked in garlic butter or maybe an alfredo sauce but when I said I was going to put a light coating on it before frying it I got, The Look. Neither one likes popcorn shrimp with the heavy breading and I think that is what they thought I was making. This is just a thin layer that just adds some flavor to the dish. Everyone was really happy with this dish. It had quite a bit of flavor from the shrimp. It was so simple to make that my kids both helped with dinner and it was ready in less than 30 minutes beginning to end. I served this with mixed vegetables and a green side salad. Dry thawed shrimp with a paper towel and add to a medium bowl. Sprinkle shrimp with Morton’s Nature’s Seasoning and flour. Toss to coat all shrimp with flour. If needed add a bit more seasoning and flour to lightly coat your shrimp. Have your pasta cooked by this point. Add butter and Parmesan cheese to taste. Heat a bit of oil in a large skillet over medium heat. Add shrimp to hot oil and allow to cook 1-2 minutes per side to brown. Remove shrimp from skillet. Serve pasta with several shrimp over the top. This sounds so incredible, I have to try it soon! Followed you on Pinterest and pinned for future reference! 🙂 Thanks for sharing your delicious recipes! It’s 10pm and I am salivating. Thank you for always sharing these excellent recipes. Hope your family and you have a wonderful Thanksgiving!! I have to try this! I love your blog! Great easy recipes! I love that you combined crispy shrimp with pasta! I’m going to have to make this one soon! I am up for trying just about anything and my kids like a bit of fried breading on the shrimp sometimes.